The coral reefs of Fagatele Bay are resilient. They have been subjected to numerous impacts, but their ecological components have been quick to recover. This inherent resilience is an important consideration in the management of the sanctuary and to the understanding how coral reefs respond to disturbances. The "crown-of-thorns" starfish, Acanthaster planci (alamea in the Samoan language), preys on coral. Usually, these starfish are a rare member of the reef community, however, plagues of "crown-of-thorns" starfish can occur for reasons that are not completely known. Such population outbreaks can rapidly kill large tracts of coral. The Fagatele Bay area supports an active commercial and recreational fishery (Figure 20). Commercial and recreational fishing combined with habitat destruction, poor recruitment and anomalous oceanographic conditions have contributed to declines of many marine species in central and northern California waters. Several runs of Chinook salmon, Coho salmon, and steelhead (O. mykiss) in central California have been federally listed as endangered and threatened since 1994. The complex life histories of these species, spanning fresh water rivers and ocean environments, subject them to negative impacts from many different sources at all stages of their lives. 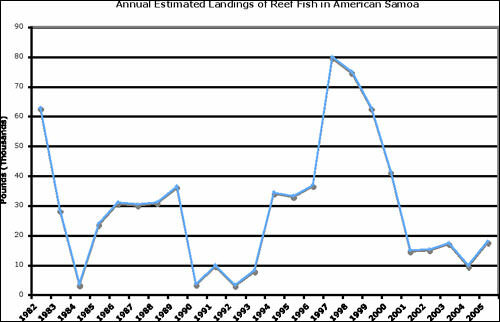 Many rockfish populations have declined under fishing pressure and years of recruitment failure due to unfavorable oceanographic conditions (Ralston 2003), and several species are currently considered overfished, including cowcod, canary, yelloweye and darkblotched rockfish (S. crameri). In 1978 and 1979, an outbreak of crown-of-thorns starfish devastated coral populations on Tutuila's reefs. The massive infestation resulted in a loss of more but this disaster helped to propel the decision for the site's designation. The soft tissues of coral are consumed when crown-of-thorns starfish feeds, leaving behind the hard coral skeleton. As long as other aspects of the ecosystem are intact and new disturbances do not occur, new coral recruitment and growth will replace the damage caused by the starfish. The reefs of American Samoa are resilient because coralline algae rapidly colonizes the dead coral skeletons and cements reef surfaces together to promote the settlement and growth of new coral colonies. Without this rapid colonization by coralline algae, wave action can cause the dead coral skeletons to fragment and turn to rubble before the new coral community can establish. American Samoa is susceptible to tropical cyclones during the southern summer from November to April. 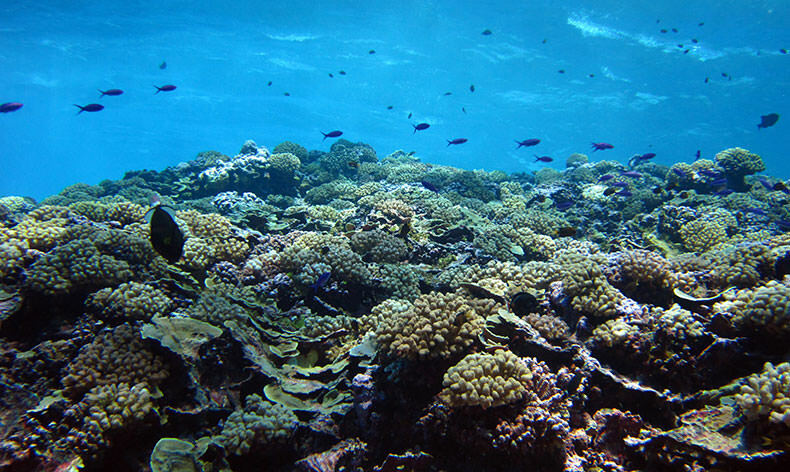 In 1990, 1991, 2004 and 2005, cyclones caused decreases in coral coverage and abundance in American Samoa and damaged the reef framework to varying degrees. When severe, damage produced large amounts of coral rubble and redistributed sediments in shallow water. On February 4, 1990, Tropical Cyclone Ofa passed about 225 kilometers to the southwest of Tutuila Island. Although the wind speed associated with this storm was not exceptionally strong during its passage, storm waves and storm surge generated by the cyclone caused damage to Fagatele Bay reefs. On December 10, 1991, Tropical Cyclone Val caused severe damage to the fringing reef systems and coastal areas of Tutuila. Together, Ofa and Val inflicted considerable damage to the reef communities within the bay. While the impacts of Heta in 2004 and Olaf in 2005 were less severe on Fagatele Bay, they caused significant damage in other parts of the archipelago. One of the most conspicuous effects of cyclones is the stripping away of many of dead and living corals, thus producing a large amount of new rubble and shingle, which undergoes considerable redistribution on the order of tens to hundreds of meters. Some structural damage occurs to the reef as well, particularly at the reef margin and reef slope zones, where sections of reef buttresses, pinnacles, and knobs can topple. However, as stated above, the coral populations of American Samoa have proven to be resilient to these damaging events and coral populations currently are in a phase of rapid recovery. In the summers of 1994, 2002, and 2003, Fagatele Bay experienced one of its most significant natural threats - unusually warm water surrounded American Samoa for several months and caused corals to "bleach," or to lose their pigment-carrying symbiotic algae partners (zooxanthellae). These algae normally live within the tissues of the coral animal and give the coral its color. A bleached coral appears brilliantly white due to the transparency of coral tissue without its zooxanthellae. Though bleaching is not always lethal, many corals were killed as a result of these bleaching events. 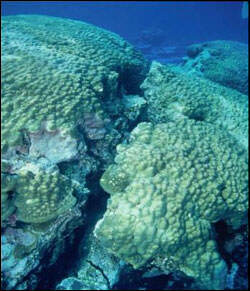 These recent bleaching events have been caused by increases in sea-surface Bleached coral in American Samoa in 1994. 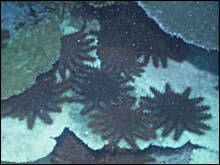 Bleached coral in American Samoa in 1994. (photo: Peter Craig) temperatures as a result of regional El Nino events and possibly the result of global warming. Only a slight increase above normal water temperature is required to initiate bleaching. It can be caused by a short-term exposure (1-2 days) to temperature elevations of 3-4 degrees Celsius, or by long-term exposure (weeks) to elevations of only 1-2 degrees Celsius. 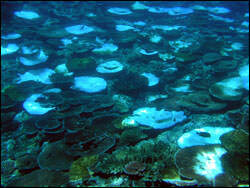 Corals can recover from bleaching if temperatures return to normal and the coral regains its symbiotic algae. However, if temperature conditions remain anomalously high for an extended period, or bleaching is particularly severe, bleached coral will die. Bleaching has been observed nearly every summer over the last decade. It affects corals mostly in shallow water, but has been observed as deep as 40 meters (130 feet). Although most fishing methods are prohibited in Fagatele Bay National Marine Sanctuary, the sanctuary's remote location makes enforcement of regulations difficult. There is significant evidence that the bay is, in fact, being fished. Several large species of reef fish that are characteristic of unfished reefs in the Indo-Pacific region are conspicuously absent or are small in size in Fagatele Bay. These include species such as Maori wrasse (humphead wrasse; Napoleon wrasse; Cheilinus undulates), sharks, and large species of grouper and parrotfish, all of which are known to be particularly vulnerable to fishing pressure. Given that many of these species are more abundant and larger in size elsewhere in the Pacific where fishing is banned, these observations suggest that fishing pressure on the reefs of American Samoa and Fagatele Bay has had a significant impact on fish populations. Because of its remote location and limited access from land, direct observation of fishing activity, both legal and illegal, are difficult to obtain; however, it is likely that poachers fish in the sanctuary when weather conditions permit. Most recently, in December 2005 law enforcement officials apprehended illegal fishermen in the sanctuary. Fishermen have the potential to very quickly reduce the population of commercial reef fish species in a small area such as Fagatele Bay. One particularly efficient harvesting technique is spearfishing at night using SCUBA equipment. Many targeted species rest on the reef during the night, making them easy targets for night fishermen. The Government of American Samoa banned SCUBA spearfishing in 2001 because of concerns by local scientists about declines in fish numbers once this technique became widely used. Evidence also suggests that fishing with explosives - an unsustainable form of fishing that is inexpensive, quick, and efficient, as well as highly destructive - has occurred in the bay. 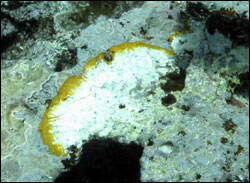 A 2001 survey found a large Porites sp. coral colony that was severely damaged. The colony had recently been split in two, and one side appeared to have been reduced to rubble. It is likely that explosives caused this damage, because approximately 9 meters of detonation cord was found adjacent to the coral colony. This colony is exceptionally large, and given the slow growth rate of this species, is estimated to be approximately 800 years of age. Although the damage can still be seen, the colony remains healthy away from the fracture. In June of 2005, a new spate of fishing with explosives was documented in Fagatele Bay. A reward for information yielded no suspects, but did bring attention to the problem and a public desire for the apprehension of anyone fishing in this manner. Outbreaks of disease on coral reefs can cause significant changes in community structure, species diversity and abundance of reef organisms. Diseases of coralline algae and corals have been documented in Fagatele Bay. These afflictions are monitored in order to be on guard for increases in their occurrence. Coralline lethal orange disease is a bacterial infection that affects encrusting coralline algae. It is identified by its bright orange color and the white dead areas it produces on affected algae. 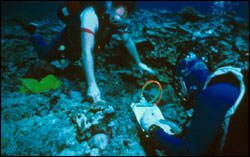 A 2004 study found that, of seven sites examined around Tutuila, coralline lethal orange disease was most prevalent in Fagatele Bay. Another disease of coralline algae is a black fungal infection that has only been reported in American Samoa. One of the most common coral diseases found in the waters of Tutuila is white syndrome. Due to the difficulty of differentiating between the coral diseases that are white in appearance, both white band and white plague diseases are placed in a category known as "white syndrome." A symptom of white syndrome disease is a distinct line or band of bleached infected coral tissue, between exposed coral skeleton and healthy coral tissue. This disease can be virulent and results in the rapid death of coral tissue. Another condition that may be a disease and is often observed around Tutuila involves skeletal growth-anomalies (hyperplasms), which cause distorted, tumor-like growths on the surface of the coral. Agriculture in American Samoa is still largely a subsistence sector with mostly traditional staple food crops, chickens and pigs. The 1999 Agriculture Census of American Samoa reported that about 41 percent of the territorial land area is being farmed, and nearly 6,500 farms were reported with an average farm size of about three acres. Of these, about 1,100 were classified as commercial operations. A farm was defined as any place that raised or produced any agricultural products for sale or consumption. Approximately 75 percent of households in American Samoa fit this description. With an increasing population and a fragile economy, American Samoa is likely to experience an increase in agricultural development, including the land surrounding Fagatele Bay. Such development may threaten water quality, habitat integrity and biological health of Fagatele Bay if soil and sediment runoff into the bay is not controlled. With two-thirds of American Samoa's 197 square kilometers having slopes greater than 30 percent and a rainfall of up to 5,000 millimeters per year, soil erosion is a constant threat. Clearing of land for agriculture within watersheds often decreases the ability of soils to absorb rainfall. Without proper land management, streams carry eroded soils, fertilizers and pesticides into nearshore waters. 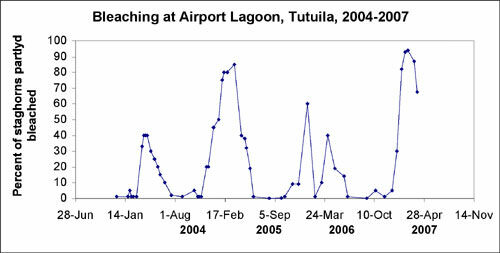 The developed watersheds around Tutuila generally discharge higher sediment loads than undeveloped areas. The steep topography of Fagatele Bay's watershed is particularly vulnerable to erosion once the land is cleared. Taro, a perennial plant with an edible tuber, is one of the most important staple crops in American Samoa. It is inherently part of the traditions, customs and culture of the Samoans and adherence to traditional cultivation practices can help reduce environmental impacts. These traditional practices include leaving trees to reduce erosion, cutting weeds to use as mulch, and using a planting stick (the oso) rather than tilling the soil. Unfortunately, these practices are often replaced by the removal of all vegetation and leaving fields to sit fallow after cultivation. Once the land is cleared, it will take decades for the forest to recover to its natural state. Without careful stewardship, forest re-growth in cleared areas may be inhibited by the rapid invasion of vines and other plant species. These invasive plants replace the native trees and ground cover with vegetation that cannot efficiently hold soil in place. This choking of the native forest by vines and other invasive species can be seen in parts of Fagatele Bay's watershed. Over the last year, landowners have cleared new areas of the slopes above Fagatele Bay for taro cultivation. This creates significant concern for the integrity of the forest ecosystem, its soil, and the bay's water quality. There is relatively little tourism in American Samoa and it is likely to be some years before the territory enters the mainstream of South Pacific tourism. The annual number of visitors to the National Park of American Samoa is currently estimated to be only 1,000 on Tutuila Island, 1,000 on Ofu Island, and 20 on Ta'u Island. About half of these tourists use marine areas of the park for swimming, snorkeling, or scuba diving. There are also few pleasure boats - about 30 anchor in Pago Pago Harbor during the cyclone season, but none are found elsewhere in the territory. Tournaments for pelagic sport fish (e.g., tuna, marlin, etc.) occur sporadically, with some 20 small local vessels competing to catch the largest fish (Peter et al. 2005). Visiting Fagatele Bay sanctuary is difficult even in good weather due to its remote location and the nature of the terrain that surrounds the bay. Because the land is privately owned, permission is also needed from the landowners to access the bay by land. Little is known about the number of people who visit the bay on a daily basis, but official patrols and visits by sanctuary staff over the past 18 years indicate those numbers are very low. There are few locally owned pleasure boats. Yachts come to Pago Pago Harbor to buy provisions and find shelter during the cyclone season. Sportfishing for pelagic tuna, mahi mahi and marlin is popular and occasional fishing tournaments are held, but these activities occur in offshore waters rather than on the coastal reefs. There are no commercial SCUBA-diving operators presently in the territory, but the potential to attract sport divers to Fagatele Bay and the territory's coral reefs exists. Despite the low numbers of visitors, human impacts on coral reefs surrounding Tutuila Island, including Fagatele Bay, have the potential to be severe. Documented impacts due to visitation of the bay are unregulated fishing, illegal collection of corals and other invertebrates, and damage to the reef from boat anchors and walking on the reef flat. Anchor damage has been observed, and in response, two mooring buoys were installed in 2006 to allow boaters to visit the bay without dropping anchor. Discarded trash is also a potential problem caused by both land and sea visitors to the bay.